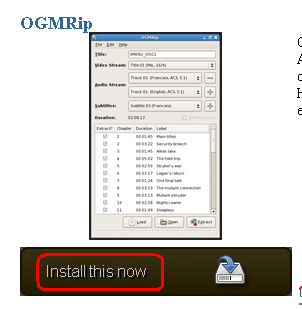 OGMRip is an application and a set of libraries for ripping and encoding DVD into AVI, OGM, MP4, or Matroska files using a wide variety of codecs. It relies on mplayer, mencoder, ogmtools, mkvtoolnix, mp4box, oggenc, lame, and faac to perform its tasks. The GUI features a clean HIG-compliant GNOME 2 interface and tries to minimize as much as possible esoteric settings. First download getdeb package from here . Click the "Install this now" button below the screenshot of the desired application. I gave this a try, ripping a copy of a DVD to .avi format. It worked great until it hit about 70% complete, then just hung there for about an hour. I tried it a few times with this same result, being forced to cancel every time. Did you try a different DVD? Does anyone else have any experiences with this? Same problem here although mine stops at 97%. I left it for about 2hrs and then canceled it.